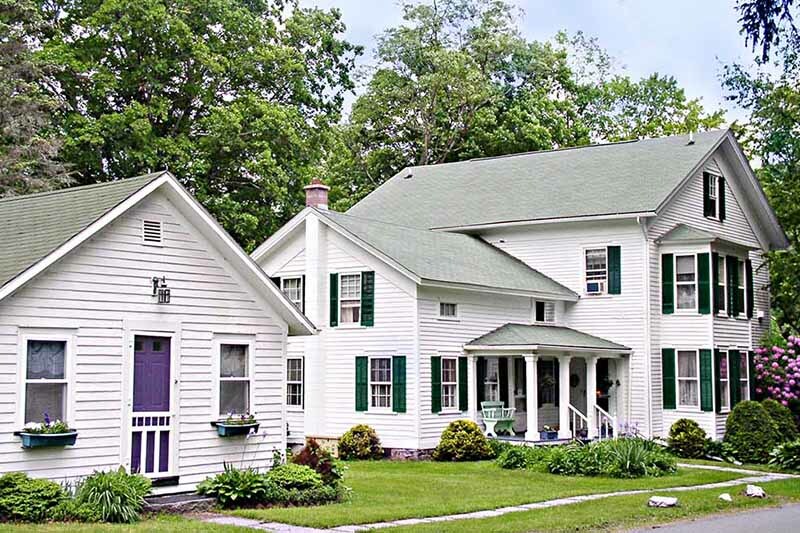 A beautiful Pennsylvania bed and breakfast inn in the Pocono Mountains. Book here for lowest rates! Verizon cell reception and Free wi-fi. 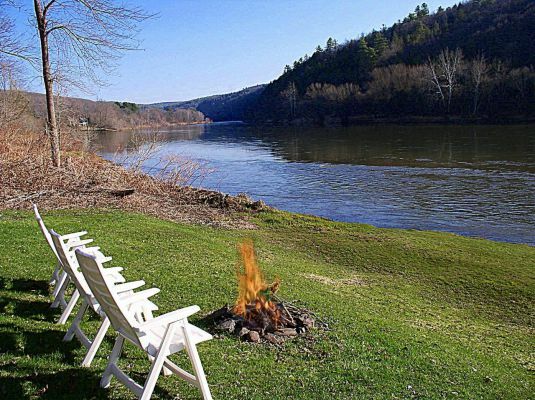 Roebling Inn is a unique Pocono getaway, catering to nature lovers, history buffs, fishermen, kayakers, hikers, cyclists, soul seekers, and romantics! It’s a special place to celebrate a birthday or anniversary and is highly recommended on Trip Advisor. 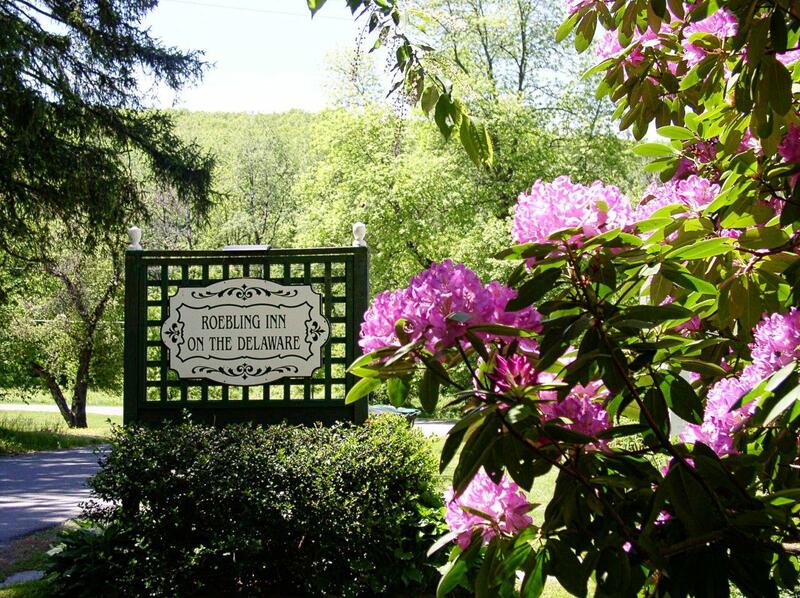 Roebling Inn is Pike County’s only bed and breakfast on the Delaware River and a NatGeotourism featured listing. 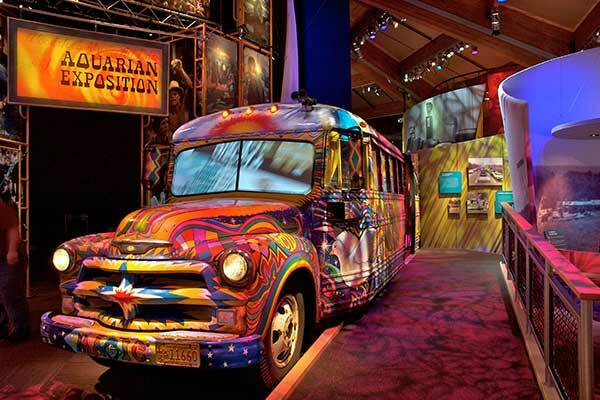 Bethel Woods, site of the 1969 Woodstock Festival, is a 30 minute drive. (It was initially going to be held in Woodstock NY. A change of plans AFTER the tickets were printed resulted in “Woodstock” happening in Bethel NY.) Multi-media museum is outstanding. Peace and nature. It’s impossible not to relax here. Guests often choose to take a morning walk to see beautiful scenery and the ever-changing river. Morning on the porch with the sound of birds is an easy way to start your day. Here’s what your day might include . 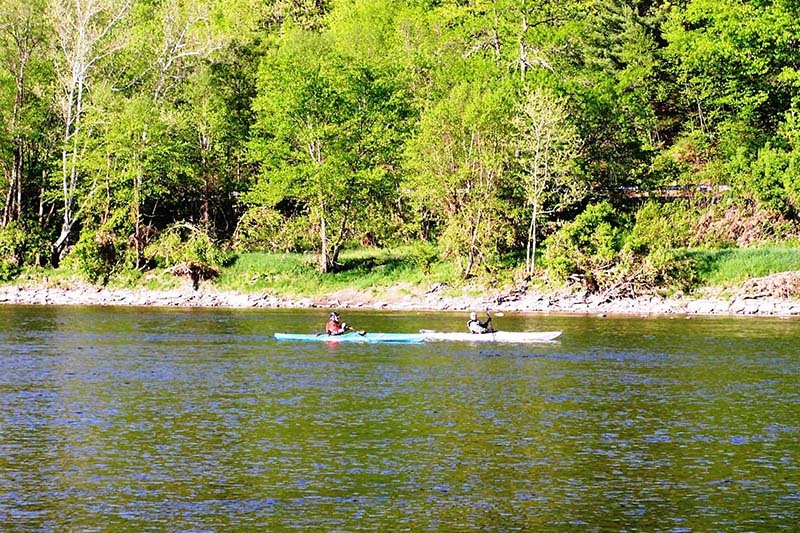 . .
♦ Kayaking May thru Oct, try a short trip at a reduced rates at a nearby livery. ♦ Visit a Buddist Temple Kadampa Meditation Center Daily tours 12-4pm. ♦ Enjoy area restaurants Peter’s, Henning’s Local, and Barryville Sports Bar. 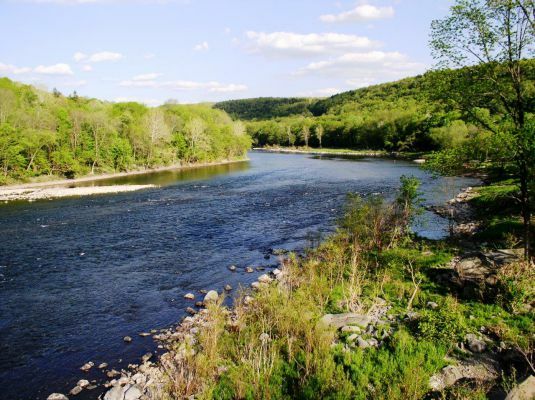 ♦ Six hiking trails in the Upper Delaware Valley. 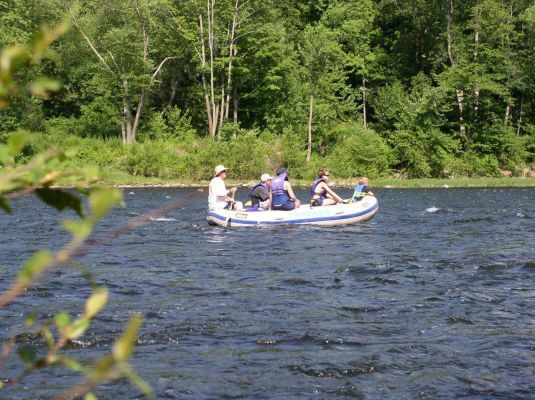 ♦ Dual racing ziplines and paintball at Kittatinny Canoes only 1/2 mile away. 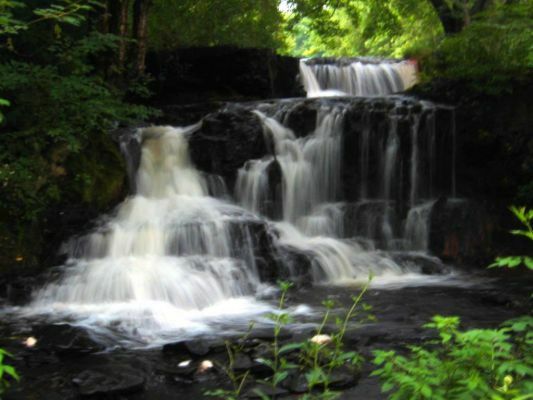 Lackawaxen, meaning swift waters, is located 2 hours east of NYC (2 1/2 hours north of Philly) on the Upper Delaware River – 73 miles (118 km) of unspoiled natural beauty dividing the New York Catskills from the Pennsylvania Pocono Mountains. Our prime riverfront location may be the best in the river valley. Song birds, water tumbling through rapids, and the effortless flow of the river create a harmony that encourages relaxation. Relax on our front porch overlooking the water as paddlers float by. Walk across the oldest suspension bridge in the country. 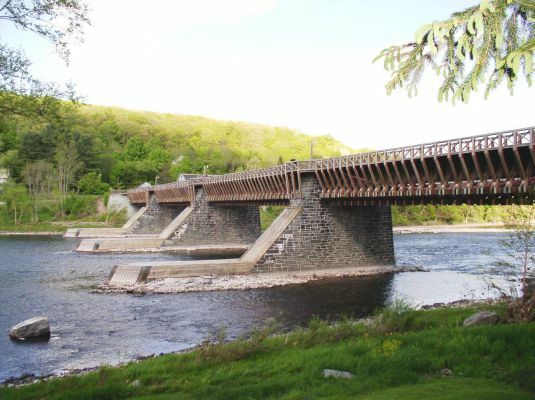 Lackawaxen is the site of Roebling’s 1848 Delaware Aqueduct, our namesake and forerunner of his later work–the Brooklyn Bridge! Fly-fishing, hiking, horseback-riding, antiquing, golf, as well as, fine local restaurants, summer theater and the arts are here for your enjoyment. 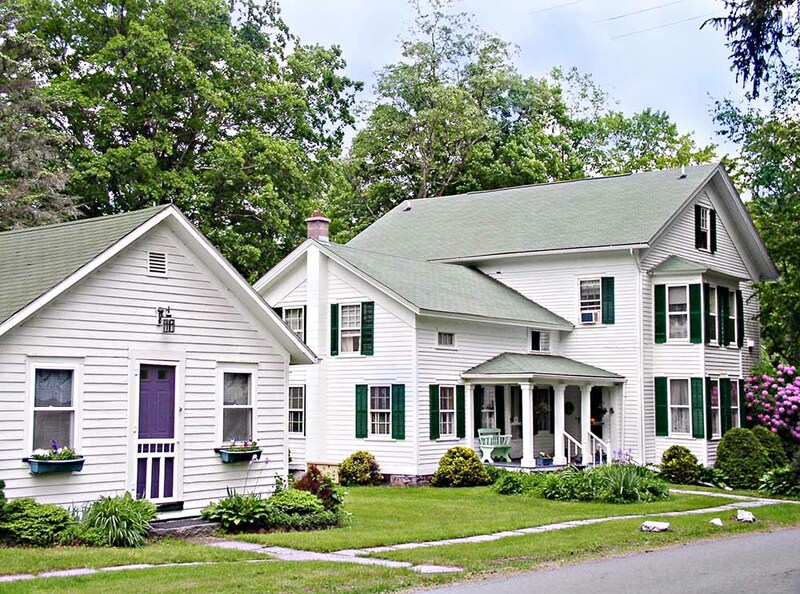 We provide immaculate, comfortable lodging in an authentic 1870 landmark, listed on the National Historic Register. There are 5 guestrooms and a 1-bedroom cottage, all with private bath, tv, a/c, and wi-fi. The common sitting room, both riverview guestrooms and the cottage have a cozy gas fireplace. 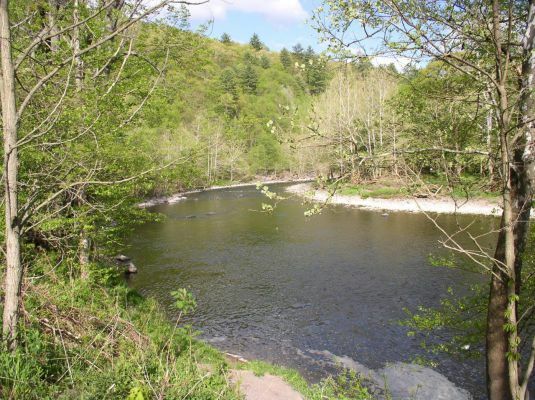 This section is the absolute BEST for canoeing, rafting, kayaking and tubing. We are located 1 mile from Kittatinny’s Barryville base, featuring paintball and dual racing ziplines. 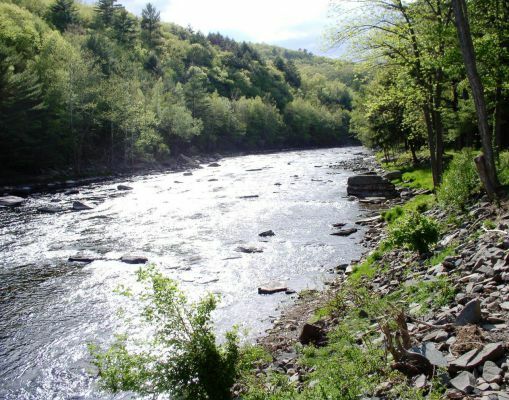 Lackawaxen, where the Delaware and Lackawaxen Rivers join, has some of the best trout and bass fishing in the eastern United States. Fish from shore or hire a drift boat guide service. Seeing a bald eagle in the wild is something special! Year-round, this is the best B&B in the Poconos to see a bald eagle. 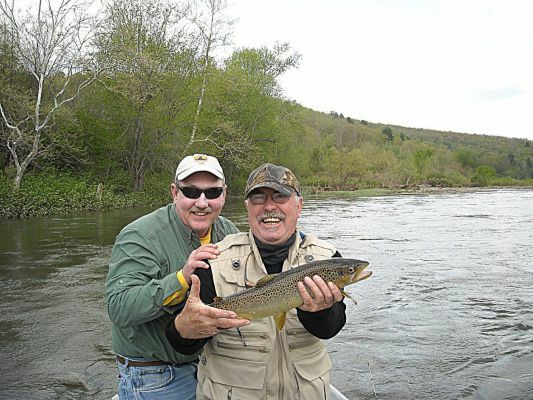 The Lackawaxen River is stocked with thousands of trout annually and is a picture-perfect river for fly or bait fishermen. 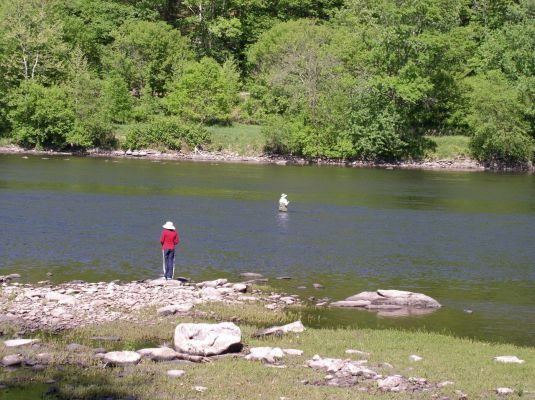 The Upper Delaware River is known for shad in May, smallmouth bass from June through October, and trout as well. 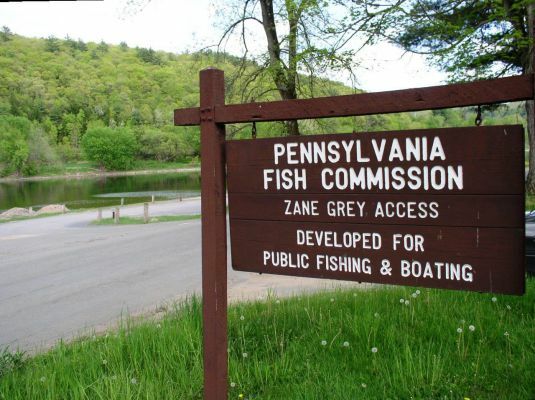 You can fish off our riverbank with a NY or PA fishing license. Licensed guides with drift boats are also available for half or full day trips. Smallmouth Bass fall season too–excellent! 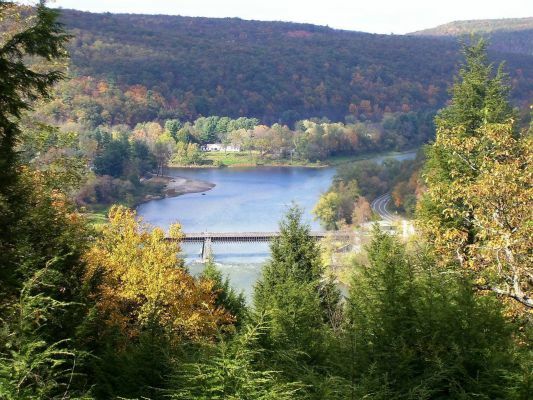 Bethel Woods, the Woodstock Museum, and the Route 97 Upper Delaware Scenic ByWay are across the river. 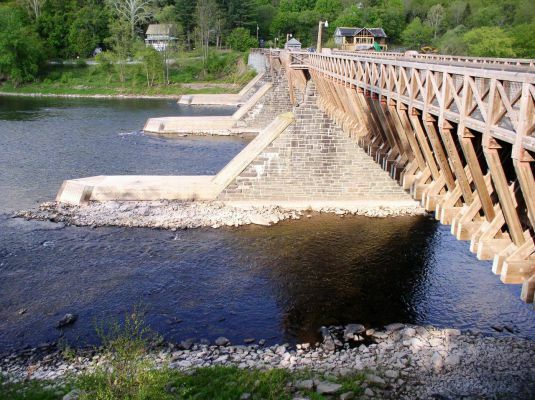 The towns of Milford, Hawley and Honesdale are an easy drive. 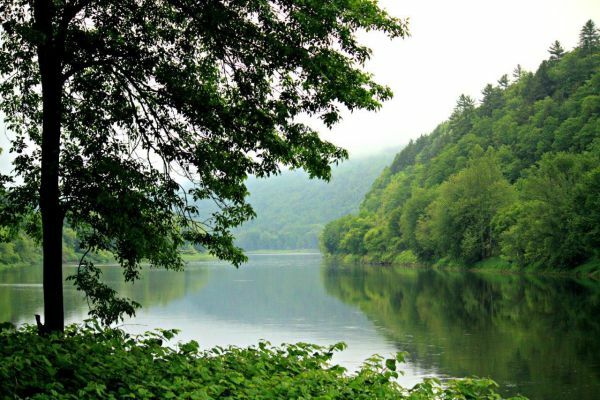 We cordially welcome you to visit this Pocono spot, settle in, and absorb the history and beauty of the Delaware River Highlands. Only 100 miles northwest of NYC, slightly off the beaten path, and a refreshing escape from urban stress. New York Magazine called it “weekend therapy”! We love it here and look forward to showing you all the area has to offer! 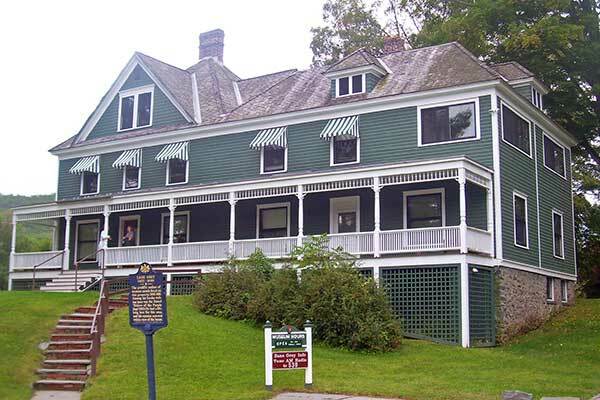 The Roebling Inn is located at 155 Scenic Drive, Lackawaxen PA, (Pike County), between two landmarks – the Zane Grey Museum and the Roebling Bridge. Driving time is two hours from New York City or 2 1/2 hours from Philadelphia. I-80 West to Exit 34B, Sparta NJ. Route 15 North to Route 206 North to Milford. At toll bridge, bear right. At first traffic light, GO STRAIGHT on Route 6 West for 12 miles. Turn right on Route 434 North for 2 miles. Bear left on Route 590 West for five miles. Cross railroad tracks and go 1/8th mile. At the Firehouse (on left), Turn right on Scenic Drive. Inn will be on right in 1/4th mile. Newark Airport: Take I-78 West to Route 24 West to I-287 North to I-80 West then as above. New York State Thruway: North from NYC to Exit 16. Route 17 West (I-86) to Exit 123, Port Jervis. Route 17M to I-84 West to Exit 1, Port Jervis. Left on Route 6 West/Main Street. At the 7th light (blinker), bear right (30mph) on Route 97 North for 24 miles.Turn left to cross the wooden Roebling Bridge into PA. Right on Scenic Drive. I-95 & Philadelphia: I-95 North to I-476 North to Route 22 East to Route 33 North to I-80 East. 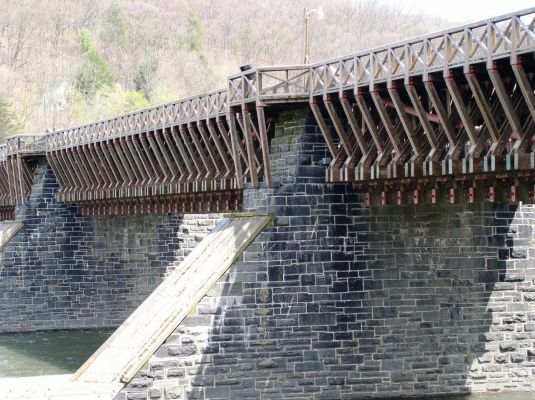 Take the Marshalls Creek Exit and Route 209 North (not business 209) to Milford PA. Straight thru light at Dimmick Inn onto Route 6 West for 12 miles. Turn right on Route 434 North for 2 miles. Bear left on Route 590 West for five miles. Cross railroad tracks and go 1/8th mile. At the Firehouse (on left), Turn right on Scenic Drive. Inn will be on right in 1/4th mile. Wilkes-Barre: I-81 North to I-84 East (follow signs to MILFORD) to the Lords Valley exit #46. Turn left from ramp onto Route 739 for 1 mile. At “84 LUMBER”, Turn right on Route 434 North for 4 miles to stop sign at Route 6. Go straight through intersection of Route 6 and continue on Route 434 for 2 more miles. Bear left on Route 590 West for five miles. Cross railroad tracks and go 1/8th mile. At the Firehouse (on left), Turn right on Scenic Drive. Inn will be on right in 1/4th mile. By Air: The closest airports are Wilkes-Barre/Scranton (AVP), Stewart-Newburgh (SWF), and Newark NJ (EWR). The nearest fly-in airport (6000′ asphalt runway) is Sullivan County International (KMSV) near Monticello NY, phone 845.583.6600.